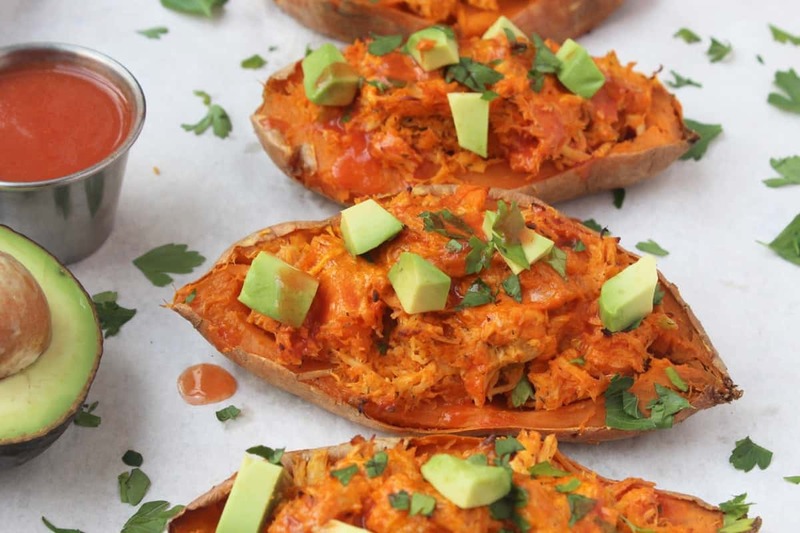 A tasty appetizer, hearty dinner, or perfect game day snack, these Buffalo Chicken Twice Baked Sweet Potatoes are delicious! Dairy free, paleo, & Whole30 approved. This recipe has my heart. 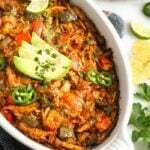 It combines two of my favorite foods, sweet potatoes and buffalo sauce. I’ve said it before, but I put buffalo/hot sauce on just about anything. Eggs for breakfast, salads for lunch, hummus for snacking, and roasted veggies and proteins for dinner. It is my go to condiment. I also eat sweet potatoes on the regular. With my eggs or in my smoothies for breakfast, in salads for lunch, straight out of the freezer for snacking (yes, seriously), and roasted, stuffed, or in fry form for dinner. You can’t go wrong with any way you make them in my opinion. 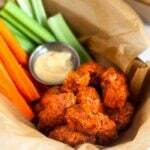 So why not combine those two things along with another favorite of mine, buffalo chicken. 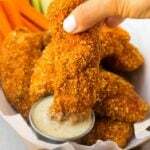 I don’t eat them too often, but I love a good chicken wing. When I was a vegetarian for 5 years it was the one animal product that I missed the most. I decided to stuff these sweet potatoes with the classic buffalo chicken flavors and then twice bake them. The chicken mixture is made up with carrots, celery, onion, spices, hot sauce, and homemade spicy chipotle mayo to keep it from drying out. For an easy prep, make all the ingredients beforehand and then just assemble. The chicken, sweet potatoes, mayo, and celery mixture can be made ahead of time. Then all you have to do it slice open the sweet potatoes, mix everything together, and bake. 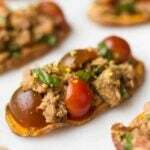 You can even bake them ahead of time and heat them up on a grill (like at a tailgate), on a sauté pan, or in the oven again. 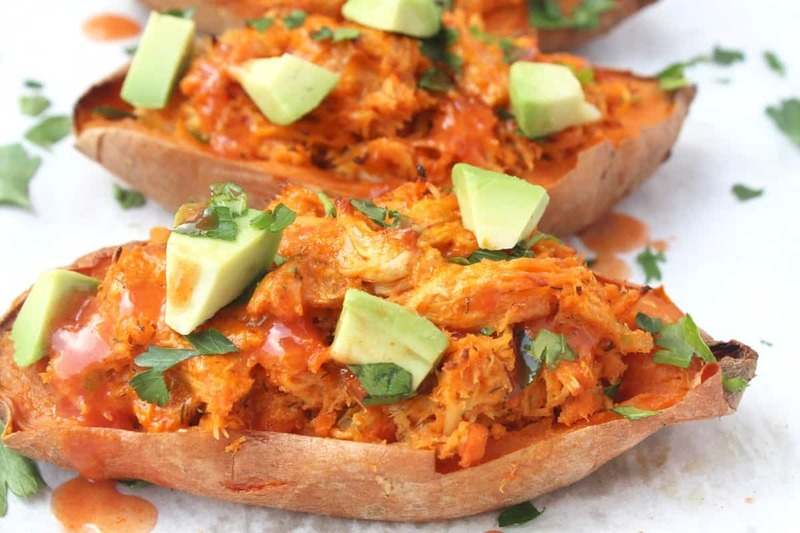 Now that football is in full swing, these buffalo chicken twice baked sweet potatoes would be perfect for a game day party! Or just sitting on the couch watching the game with your significant other or friends. 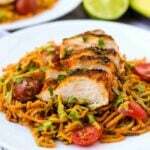 The past few weeks I have been posting easy and delicious game day recipes. First it was my sweet potato pizza, then crispy potato wedges, and now these stuffed sweet potatoes. I think I’ll keep this theme going strong. 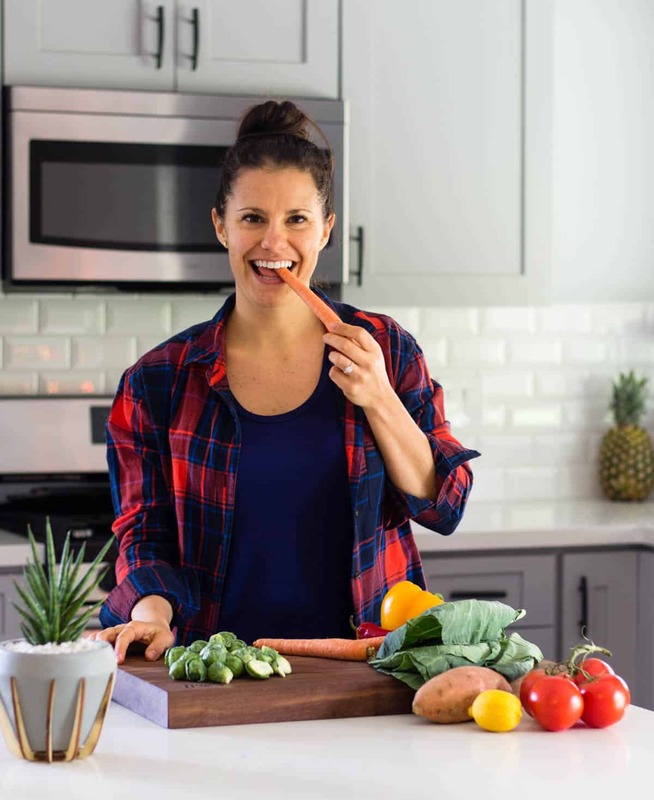 Head on over to Cassy’s blog Fed + Fit to find the recipe! What are some of your favorite foods? Do you ever combine them together? Oh these look so good! Another Epic way to enjoy sweet potatoes! Gonna check out the recipe now! My husband would LOVE these. Were huge fans of all things buffalo. Yay for all things buffalo! I can’t get enough either. Hope you like them! Ah! These look so good! A total complete perfect meal! Sweet potatoes for the win! Sweet potatoes always win!! Thanks Rebecca! STOP! My boyfriend is going to cry when I make these! Going on the list for next week – I’m SO pumped! You’re amazing! What is the Spices you used?